We all know what Illegitimate children have been called, Illegitimate countries have not; especially if the foetus grew out of a media that ignores the illegitimate conception. There are illegitimate governments. A few years ago, a blogger who didn't use his own name asked the question: "How Do We View Illegitimate Governments That Do Not Have the Consent of the Governed?" "When they serve our purposes, we are quick to recognize them and open diplomatic relations. Even when the changeover in power is by military coup." We Americans tried to bastardize Venezuela's president Hugo Chavez. On the other hand, we supported General Musharraf's overthrow of the government in Pakistan. Military coups actually do a job of delegitimizing the government in power. The difficult term delegitimize, which seems to be the best way to describe the event, has been said, "To revoke the legal or legitimate status of a government." Webster says it means "to diminish or destroy the legitimacy, prestige, or authority" of a government." Oscar Arias Sanchez defined it: "To revoke the legal or legitimate status of: ‘Out of poverty sprout social instability and desperation, which delegitimize governments that declare themselves democratic’." The example is particularly relevant to Israel and their treatment of the Palestinians. The Israeli Palestinians have been kept in poverty, even in Israel where the pretence that they are part of a democratic society is a ruse. What will be done to delegitimize Israel? "The campaign, involving boycotts, protests and calls for divestment...” said the Israeli Reut Institute. The Institute predicted where and who would be involved. In a summary of their report, the Reut Institute said the international effort--dominated by left-wing activists and non-governmental organizations in London, Toronto, Brussels, Madrid and the San Francisco-Oakland area--seeks to "turn Israel into a pariah state by undermining its moral legitimacy and ultimately aspiring towards eliminating the 'Zionist entity..."
Several novel events, apart from the campaigns to delegitimize Israel have taken place recently, forcing media attention. Two top military men--Centcom head General David Petraeus and Joint Chief of Staff Admiral Mike Mullen have both questioned Israel's usefulness to the United States. In the past, the Zionist controlled US media was able to ignore critical statements about Israel by retired generals and admirals. However, both Petraeus and Mullen are frontline commanders. When they say that the American relationship with Israel harms American interests, the media has to listen and report it. Second, leading figures in the US administration--the President, Vice President and Secretary of State finally stood up briefly to Israel when Israel flaunted settlement expansion in American faces. 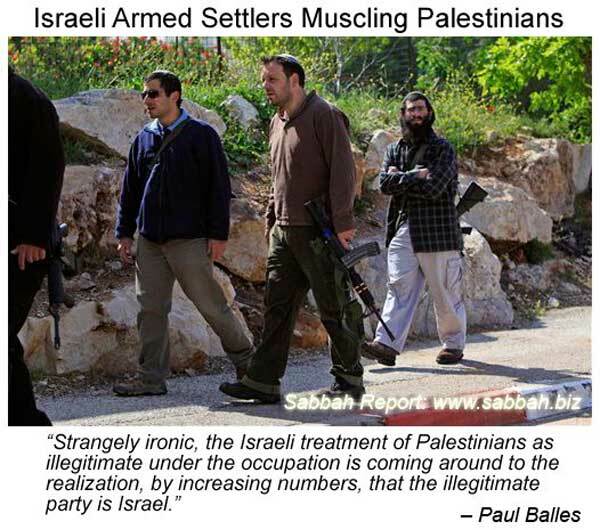 The settlements have been considered the most illegitimate activity of the Israeli government. The media couldn’t avoid reporting Israel's insulting behaviour. Third, while the American public has resisted calls for war with Iran, the Israeli hawks and American Zionists have continued their propaganda campaigns for preemptive bombing. The public has grown tired of the Israeli self-serving propaganda that could drag America, with the consent of a Zionist controlled Congress, into another Mideast war. Last, a number of respected leaders and scholars have spoken out against Israel's misadventures. Former President Jimmy Carter has persuaded a number of Americans that Israel is an apartheid state, whether he intended that result or not. In addition to Carter, two leading scholars, political science professor John Mearshimer of the University of Chicago and Stephen Walt, Professor of International Affairs at Harvard University have decried The Israeli Lobby (AIPAC) and US Foreign Policy. The Goldstone report, by a South African Jewish judge, on the responsibility of Israel for the carnage in Gaza has, as Richard Falk noted, "...challenged the UN to impose accountability on the Israeli political and military leadership for their alleged war crimes and crimes against humanity." Thus the ground for delegitimization is fertile. What can be done? Richard Falk has observed, "by boycotting cultural and academic activities, by disrupting trade relations through divestment moves or through refusals to load and unload ships and planes carrying cargo to or from Israel, and by pressuring governments to impose economic sanctions." Meanwhile, the Reut report in Israel is preparing the Israelis for a counter campaign, something that Zionist organizations in both Israel and America have mastered. They start with a warning that implies the old anti-Semitism label. Their report says these "Hubs of delegitimization...are places that combine an internal dynamic of strong fundamental anti-Israeli activity that stretches far beyond legitimate criticism of Israeli policies, with a strong global impact..."
The reasoning for the choices of venues? The Institute says, "These hubs are usually global metropolises that concentrate international media, leading judicial institutions, major academic centres, international NGOs and human rights organizations." What will the Zionists do to counter the delegitimization efforts? Remember, they are the greatest distorters of truth ever to subjugate the world's media. They will create comparisons designed to mislead: Reut said there is a "coalescence" between "two parallel processes" — the so-called delegitimization forces, such as NGOs and leftist organizations, and the militant Islamist efforts led by groups like Hamas and Hezbollah. Since they have already portrayed Hamas and Hezbollah as scoundrels and terrorists, this ploy will transfer those negative images to the organizations involved in delegitimization efforts. They have already recommended that Mossad, Israel's spy agency, become involved. The Reut Think Tank recommends that Mossad "intelligence agents should, in addition to passing on information to decision-makers on crucial issues like global terrorism and the Iranian nuclear program also pay closer attention to perceived attacks on Israel's legitimacy." What will Zionists do to try to defeat the efforts to delegitimize Israel? As usual, they will ignore or deny any criticism of Israel. They will repeat every slogan or line that has ever conjured up sympathy for Israel. They will advise Israeli spokespersons on what to say against any of the measures questioning the legitimacy of Israel. They have been at this for decades. The spokespersons will advise political commentators and members of Congress so they all take the same lines. Israeli spokespeople will dismiss the assumption that Israel is like South Africa as inherently anti-Zionist and racist. They will claim it assumes that the Jewish people have no right to self-determination. Zionists will insist that initiatives that single out Israel assume that the entire fault for the conflict is on one side, and ignores terrorism. They will argue that those who sponsor these initiatives admit that their goal is the destruction of Israel. Israel supporters repeatedly argue that no other state is singled out for this treatment despite flagrant violations of human rights in China, Sudan, Iran, Libya and elsewhere. They will condemn those who subscribe to delegitimizing activities, using ad hominem attacks instead of arguments against the issues. Zionists will accuse critics of ant-Semitism or of being self-hating Jews if the critics are Jewish. The best result of delegitimizing Israel will be the attention that the media will be forced to pay to it. They will be hard pressed to give coverage to Israel's critics and to avoid the one-sided defences of Israeli misdeeds and illegitimacy.